Kenworth is building only 75 T950 Legend trucks. 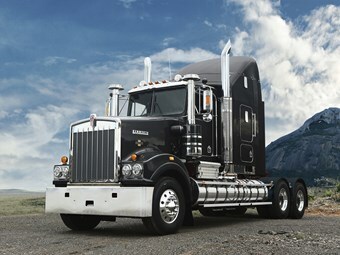 The T950 was dropped from the local Kenworth line-up in 2007, but it has retained a loyal following. It’s probably been the worst kept secret in recent trucking memory, but Kenworth has announced the return of an Australian icon: the T950. The T950 Legend will be a strictly limited build of only 75 trucks and is touted to pay homage to the brand’s longstanding tough-as-nails image on the Australian market. And if you happen to be reaching for the cheque book to place your order right away, you’re already too late. All 75 prime movers were snapped up within 48 hours of release of the big banger. The T950 was dropped from the local Kenworth line-up back in 2007, but the towering conventional has retained a loyal following with diehard followers of the brand. The raised cab and long bonnet of the T950 means there is no engine intrusion into the cab of the truck. While the imposing old school look of the revived T950 brings to mind multi trailer roles in the back of beyond, the model has also found favour over the years with loggers, livestock haulers and even east coast single trailer operators. Previous limited edition trucks from Kenworth’s Australian factory at Bayswater in Victoria have been restricted to bolt on bling and some custom work on existing models such as the recent Director series T909. However, the release of the T950 marks the first time Kenworth has released a built-on-the-production-line limited build vehicle. A custom interior with custom badging gives the Kenny the traditional look even down to the woodgrain gear knob, while outside retro Kenworth and Cummins badging have been specially manufactured for this truck. Under that long bonnet lies a suitably vintage beige coloured ISXe5 Cummins engine. The move by Paccar into a seriously limited edition vehicle has also sparked speculation there may be more to come from Kenworth in that department in the future.